Time spent on bugs, which can be billed per working hour per day for the client are billable hours. On the other hand, time spent on bugs that cannot be billed to the client are non-billable hours. Select the project in Projects and click Timesheet. Now, select Add log time in the upper-right corner to log time on a daily basis or for a week. You can log time from the List view, Grid view and Calendar. Next, enter the details in the Add log hour form. You can select bug from the Bugs drop down or you can also create a new bug to log time. And, select the Billing Status and the hours or you can also Set the Start and End Time. Next, select Submit to add the log time for the bug to your timesheet records. This logs your working hours in the project timesheet. Click Add log time in the upper-right corner in Timesheet and select Weekly Log Time. Now, you can enter the log details. This logs your weekly working hours in the project timesheet. By default, 5 rows are shown for adding your time entries you can make use of Add Row to include any number of rows for your weekly timesheet. You can click the arrow in the right corner of the timesheet to view the Previous and Next week. Originally, the only supported format of time entry was with a colon i,e 3:30. We've now included additional support for more time entry formats. For Example, if you enter 3.75, our timesheets automatically interprets the entered time as 3 hours and 45 minutes. You can edit /delete log hours from the timesheet, anytime you wish. 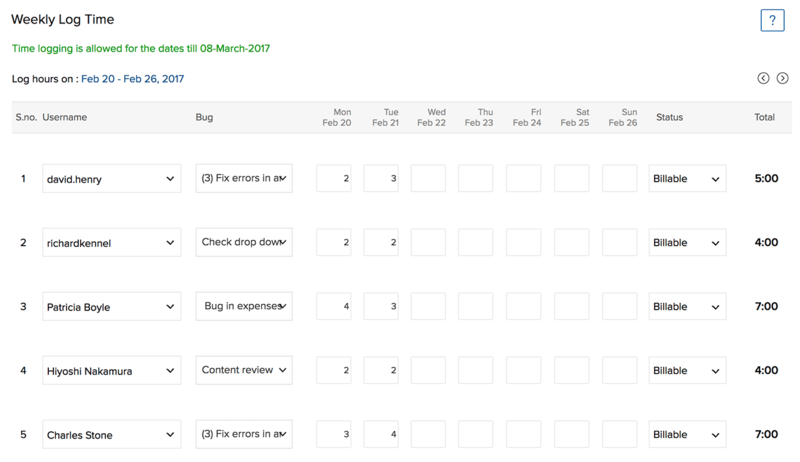 Click the Timesheets module and you can view all the bugs for which you've logged time. Select the bug that you want to edit or delete and click and select Edit or Delete to edit or delete the time log entry. 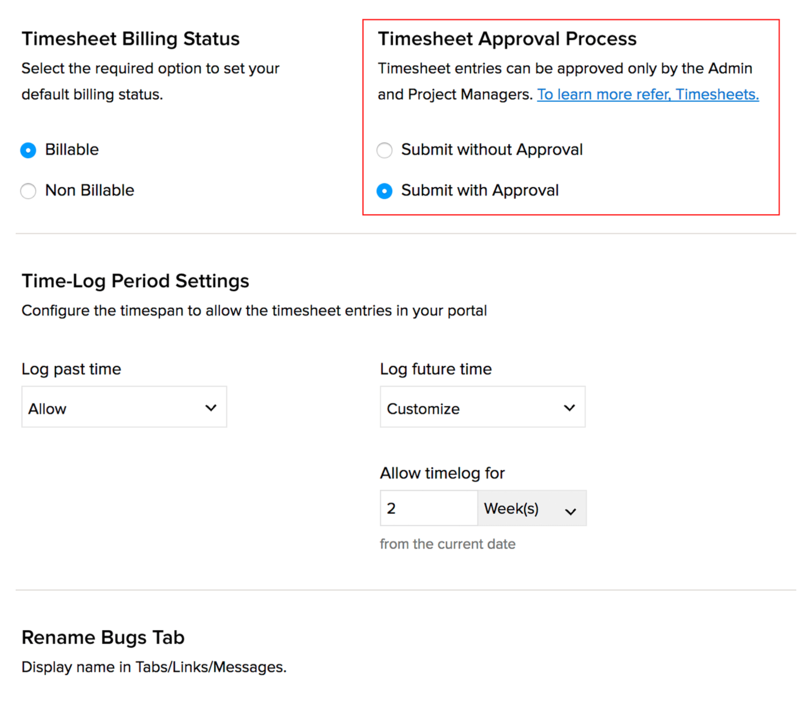 You can now set an approval process for timesheets to streamline approvals and billing for the time logs. Click in the upper-right corner and select Org Settings in Portal Configuration. Select Bug and Timesheet and set the timesheet approval process for your timesheet by choosing the option Submit with Approval or Submit without Approval in Timesheet Approval Process. ​​Note: The timesheet entries can only be approved by the Admin and Project Managers. Submit without Approval: If you select this option, all your timesheet entries need no approval for billing. They will be billed automatically. Submit with Approval: If you select this option, the timesheet entries need approval for billing. Unapproved entries are displayed as notifications in red, on the Timesheet icon inside the respective project. You must select a timesheet entry to enable Approve Timesheet Entry and the entry can be approved as a single item or in bulk. In List view, the timesheet entries can be filtered based on their approval status for billing. Click in the upper-right corner and filter your timesheet details based on User, Type, Time, and Status. Also while generating the invoice, only the approved timesheet entries are billed. 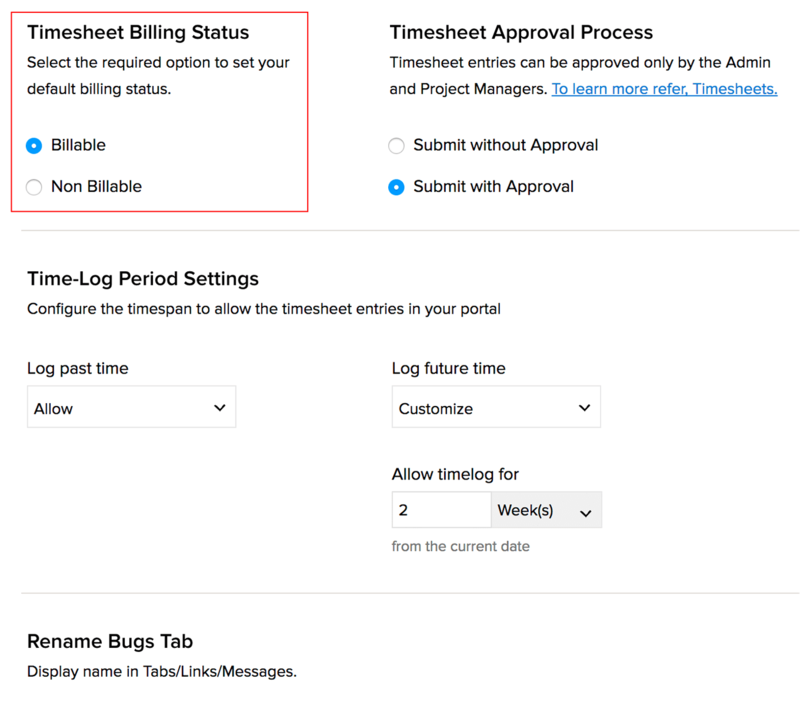 InBug and Timesheet, you can set the default billing status for your timesheet entries by choosing the Billable or Non Billable option under Timesheet Settings. 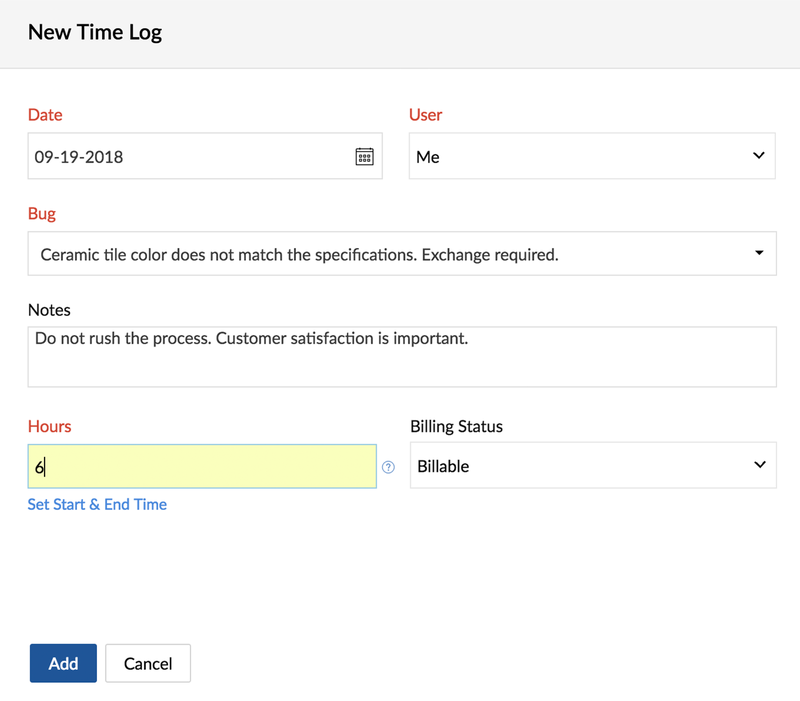 Based on the selected option, the default billing status will be displayed when you log time in your timesheet. 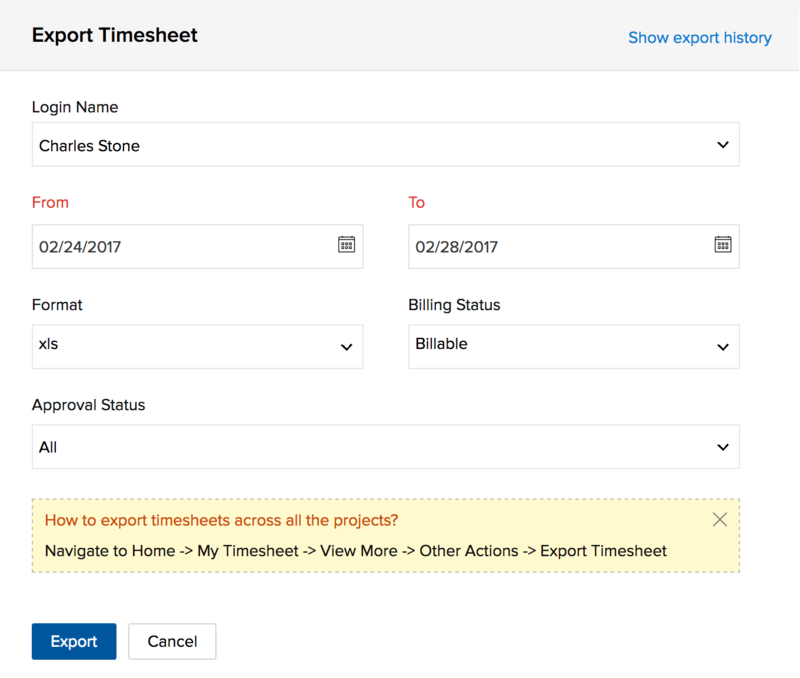 You can export your timesheets in the desired format as an .xls or a .csv file with the billing status for the selected time period. Furthermore, you can export user based timesheet for employee payroll or bill client for payments. Select the required project in Projects, and then click Timesheet. Click in the upper-right corner and choose Export Timesheet. Select the project user, choose the date range to export, enter the billing and approval status and choose the desired format (xls / csv) to export the timesheet data. Note: You can also export timesheet from Home. Navigate to Home and click My Timesheet. Select View More and click to select the Export Timesheet option. You can also export timesheets as pdf using the Export to pdf option. And you can also select Create Invoice to create an invoice.